On October 16th, 2012, Pete’s Dragon was released for the first time in a 2-disc Blu-ray Combo Pack in honor of its 35th anniversary. It’s been years since I had seen Pete’s Dragon, but I still remembered one song very clearly: “Candle on the Water”, which was nominated in 1977 for an Oscar for “Best Original Song”. Pete’s Dragon is a comedic musical following the adventures of orphaned Pete (Sean Marshall) and his best friend, a sometimes invisible dragon named Elliott (voiced by Charlie Callas). Pete has just run away from his foster family, and has decided that the town of Passamaquoddy, Maine, seems like a nice place to live. Pete has a chance of making of a go of it there, if only Elliott can stay out of trouble. Elliott reveals himself to a kindly drunk named Lampie (Mickey Rooney), who then tells everyone that he can get to listen to him that there is a dragon loose in their small town. Meanwhile, Pete has captured the heart of Lampie’s daughter, Nora (Helen Reddy), and caretaker of the town’s lighthouse. Nora takes Pete in, and he finally gets a taste of what it is like to be part of a loving and caring family. Pete’s happiness is threatened when a con man traveling through Passamaquoddy hears about the dragon and decides to capture Elliott and turn him into ingredients for his various elixirs, and when his abusive foster family comes searching for him in Passamaquoddy. I have very few memories of seeing Pete’s Dragon as a child; mostly I remembered “Candle on the Water”, Nora’s beau who was lost at sea, and Elliott the invisible dragon. I’d completely forgotten about the antagonists of the film, as well as Mickey Rooney’s hysterical performance as Lampie. Pete’s Dragon is much more likely to make an impression on nostalgic adults who remember it from their late childhood; I attempted to get my 4-year-old daughter interested in the film because she loves dragons, but sadly she lost interest in it after just a few minutes. I hope that other parents will have better luck attempting to share this movie with their children. 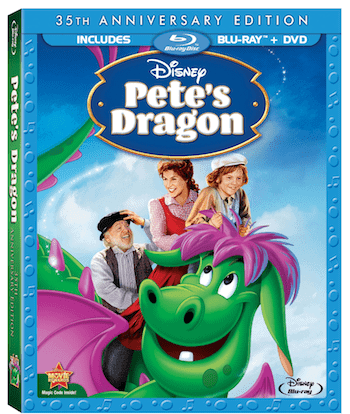 Note: No new features have been added to this; the 2-disc set contains all of the bonus features from when Pete’s Dragon was released on DVD in 2009. Brazzle Dazzle Effects: Behind Disney’s Movie Magic This feature is narrated by Pete (Sean Marshall), who takes viewers through his experience of working with animation. Deleted Storyboard Sequence: “Terminus & Hoagy Hunt Elliott” See a scene that did not make it into the final cut of the film; this is a dialogue recording session set to the storyboard for that scene. Original Story Board Concept: “Boo Bop Bopbop Bop (I Love You, Too) This is the first demo recording set to the story sketches of Pete singing this song to Elliott. This is a very cute movie and a great stocking stuffer! I really like Pete’s Dragon! I watched this movie many times, and I am glad to see that it is coming out on BluRay! I am very interested in watching this movie with my family! I am a movie buff! Thank you for this review, I love when they release movies on DVD and blu ray. Yes great movie, great stocking stuffer and perfect to watch Christmas morning while the bird is in the oven! Thanks for the great review. This movie was a big hit in my family. I remember watching this movie when I was little. I guess my love of dragons came from when I was a child. So glad to see this re-released. I loved it when I was a kid.